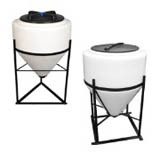 Tired of cone bottom plastic tanks that require a separate stand? These cylindrical tanks can help! Rather than using the support of a steel stand that is supplied separately,these units come with a built-in stand made entirely of polyethylene. Equipped with all the advantages of polyethylene, these tanks offer a high resistance to a variety of chemicals as well as to rusting and corroding. 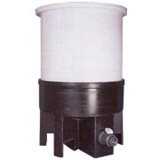 This can provide you with a longer lasting tank that is supported and drainable. The standard version of this tank is made with an open top for easy mixing and pouring of chemicals. 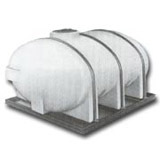 If your materials require a more enclosed storage, covers to fit these tanks are also available.